Preserving is probably the oldest intervention humans have wanted to make to food. That is not to say that when man first donned a loincloth and dragged his nominal wife around by her hair he was wondering how to make the butchered elk leg go an extra day, but certainly historical evidence suggests it was a present and pressing concern at least as far back as the ancients. It does not have to be primarily a chemical process; it can be a physical one. For example, for the last several thousand years, several types of food have been dried in order to preserve them. The drying process can significantly extend the life of vegetable and fruit foods as well as meats. In parts of the world they even dry out tarantula spiders in order to preserve them (Figure 1). There are several ways of drying foods. Sunlight can be used – we have all seen, if not bought, sun-dried tomatoes – but also wind. Carpaccio, although it sounds like a cheap fortified wine, drunk only as shots by pissed-up Australians, was originally wind-dried Italian beef1. 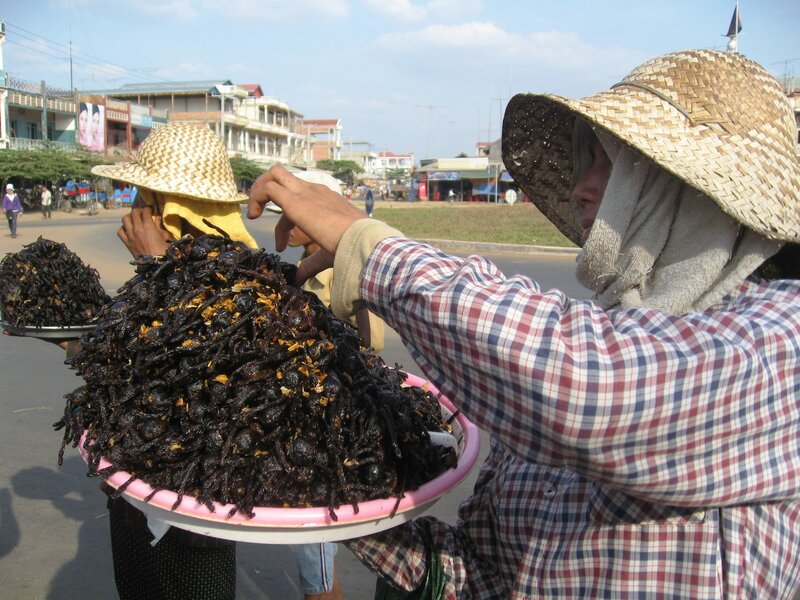 Figure 1 – Tarantula spiders that are dried and eaten in some parts of the world*. resulted. The conflict between the Netherlands and Portuguese in the 18th Century was fought more or less directly over nutmeg. Although pork with nutmeg is a seemingly odd combination today, it is a delicious one. What Does Drying Do, and Why Does it Work? Drying, whether with salt or not, works in the same way that adding sugar and heating to make jam works as a method of preserving food. You will know from experience that eating salty or very sugary (rather than just sweet) food makes one thirsty. The same is true of microbes exposed to high concentrations of sugar or salt. The sugar and salt draw the water out from them, too. However when the sugar or salt content is sufficiently high, so much water is drawn out, it kills them. This is how to spot poor-quality jam: mould will grow on it. The same principle can be applied to dried beef: the salts and other things within the meat fibres have reached a concentration that prevents microbes from living on them. There is a secondary reason why covering a pork joint in salt will preserve it. It also forms a barrier between the meat and the air. This prevents the air-borne bacteria and fungi from ever reaching the food in the first place – it is a barrier between the food and the outside world. Today the principle barriers in use are plastic films and canning, as part of sealed packaging, and so on for just this purpose. The E numbers we use to preserve foods are plentiful, in fact there are two groups for this job. There are the numbers E200-299 (general preservatives) and E300-399 (anti-oxidants). The E300s are perhaps the most interesting because of how they are misunderstood. ‘Anti-oxidants’ are, to a lot of people, something to do with hand cream and young-looking skin. Perversely, the same chemicals that give these creams their anti-oxidant (preservative) properties are often the same ones that appear in food. And while a bit of vitamin C (ascorbic acid, otherwise known as E300) is not going to turn a shrivelled apricot into a peachy baby’s bottom, it will delay the fats in that cream from going rancid. If you want to test this experiment at home, take a bottle of lemon juice and a fresh apple. Halve said apple, put the face of one half in the lemon juice and the other on a windowsill and leave for a couple of hours. Compare the state of the two after this time. 1 A. de Conte, ‘Amaretto, Apple Cakes and Artichokes’, Vintage Books, 2006. Although the idea of chemical flavourings is well known, individual chemicals that add a particular flavour to a food rarely exist in pure form. For example, a lot of things that smell quite nice taste disgusting. It works the other way around as well: chloroform, for example, has a wincing smell that is cold to the touch, and heavy to lift and carry. I did not think much of it, but from the screams and dramatic throes of every other victim in Agatha Christie novels, I was never sure I wanted to get close. However once in the laboratory as a postgraduate I breathed it in by accident, onto my tongue, and found it tasted quite sweet. Conversely, molasses for animal feed smells delicious, rather like treacle. I am reliably informed that the taste of this feed fails to match its odour however. The evidence for this was a fit of vomiting by a friend who dared, one cold Sunday morning, to taste the molasses used in her horse’s breakfast. The traditional reason that chemical flavourings have not assumed a big place in food manufacturing is that we can flavour food with herbs and spices, and have done for probably thousands of years. These, however, are not flavourings as chemists would understand them. The flavour of nutmeg, cinnamon or tarragon, are the result of a variety of compounds present. Indeed, several may be shared between any two flavours. Generally, known flavours like tomato or cranberry are not supplanted directly into foods, but chemicals that enhance the flavours can be used on top of ingredients that are already there. We use many of these flavour enhancers without thinking about it. Sugar, salt, lemon juice, vinegar and mustard are all ordinary kitchen ingredients but good enhancers of flavour. Of course they can be flavours on their own, but are often used simply to enhance flavour. Thus in putting the flavour back into our cooked carrot for selling on, we might add a little sugar and/or salt to do this. Like our colour perception, our flavouring sense is also fallible. For example, if you buy strawberry jelly from the supermarket, and make it up according to the instructions, it will be a nice red colour (as we expect, it being of the strawberry persuasion), and smell sweet and fruity. Most of us will dive into eating it quite happily if we are hungry. However, if you stop for a second and compare the smell of said strawberry jelly to the smell of fresh strawberries from the same supermarket, both the smell and flavour are rather different. Fresh strawberries actually have little smell most of the time and taste quite sour. The sourness is why we add sugar to them – to make them palatable. This is the basis for my demonstration of strawberry jelly, which we started above with the analysis by colour. I split the audience up into four groups, giving them one each of the jellies, one red, one orange, one blue and one green. They are to smell the jelly and decide without saying anything, whether or not they think they have the strawberry one. The response is different every time. However, as well as all of them having ‘the strawberry jelly’, none of them do. What we observe, is that it is strawberry flavouring, and not real strawberries, that are used to make it. This has been exploited in some creative ways. One of Heston Blumenthal’s more famous dishes is an orange and beetroot jelly. There are two blocks – one is red and one is orange. However blood orange is used so that the orange-flavoured one looks beetroot coloured, and paprika beetroot is used so that the beetroot-flavoured one looks orange. America. It is believed to be this ingredient that makes the “red ones taste better” in a certain chocolate-based confectionery. We can only imagine the horror suffered by ardent vegetarians when this beetle-based ingredient was made public knowledge. Not surprisingly, it is not designated as ‘vegetarian friendly’ by the Vegetarian Society of The United Kingdom (VSUK)3. The company that produces this particular confectionery has since discontinued the use of it, having replaced it with an Hibiscus extract, E163, referred to as anthocyanin. Another red dye that is acceptable to the VSUK is E160. This is a group of compounds related to vitamin A and includes lycopene (E160d). When I first heard of it, I thought it was a stretchy elastic material worn by ardent runners, cyclists and people who do fitness videos – some sort of hideous combination of Lycra and neoprene. 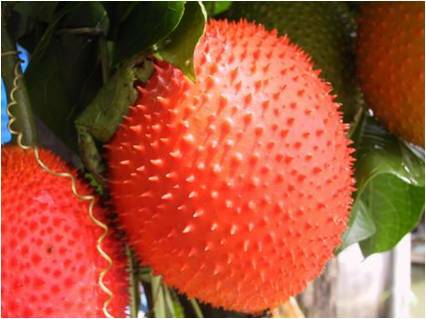 Fortunately, it is a red colouring found in various plants that can also be used as a preservative. Although it is found in a variety of vegetable sources, in practice tomatoes are the principle source for most humans. 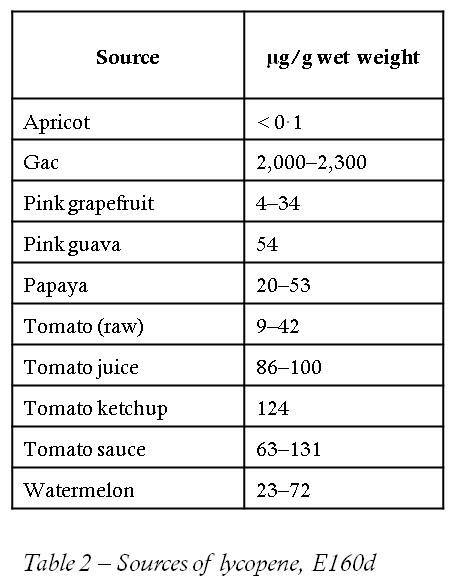 A really potent source is the Gac fruit, though there are many others (Table). Lycopene is also one of the carotenes. As the name carotene suggests, it is related to derivatives of vitamin A (first found in carrots) and so has similar properties to them. It is not necessary to understand the precise chemistry of lycopene to make sense of its uses, or understand why it does what it does. However, if we examine the structure of the compound (Figure 2) we can see that there are obvious similarities between it and fatty acids (Figure 3). Rancidity occurs when parts of the fatty acids (Figure 3) react with the oxygen in the air, which is what makes them go rancid. Rancidity, by the by, is more to do with decaying flesh than has-been celebrities. So, in wanting to make foods containing fats last longer, we need to do something that will avoid fatty acids becoming rancid. Lycopene ‘takes the hit’ instead of the fatty acids doing so; it reacts with the nearby oxygen instead of the fats. This is rather like a left-wing tax system in which a richer person’s money is used to protect a poorer person’s, even though it has the same value. However, unlike the traditional view of rich and poor, these two are as fat as one another. The similarity in structures has a more general aspect, something that scientists call a physical property. Not only do the two compounds behave in a certain way when exposed to the air (chemical property) but the structural similarity also means lycopene dissolves better in fatty foods than watery ones. This ability to dissolve in one another is their similarity in physical properties. Sadly the fact that vitamin A and similar things can dissolve in fats is not the tempting justification for eating fatty foods I had hoped for. Is Colouring Worth the Hassle? You may be wondering why we need to use colouring at all though. After all, food has plenty of colour – all sorts of plants are green, many fruits are red and so on. The problem comes with two main processes. First, cooking. Boiling carrots affects the colour. This may seem a trivial problem at home; if you bought decent carrots and cooked them yourself, and under the dubious light of a dinner time/party, no one really notices. The trouble is that for someone who wants to manufacture and sell this carrot, in a jar for example, they find it will be judged much more harshly than at a vegetable-infested soirée. The consumer has not seen the glorious fresh carrots that went into making the mashed carrot. Nor has he, or she, seen the delicate simmering in the pan. They have also not seen the unidentifiable stain on the saucepan either, but that is still the first rule of catering service: ‘What the eye don’t see, the chef gets away with’. Either way, as you may expect, the consumer will judge it only on what is in front of them. If plain cooked carrot is put in a jar, in the supermarket this will fall short of what consumers expect from the fresh carrots they will have from fresh carrots two aisles away. Second, is ageing of food. Like humans, shrivelling, shortening, wrinkling and varicose veins are all part and parcel of the ageing of food. Well, not the varicose veins, but you could be forgiven for thinking that when you see the reduced sections of some supermarkets. Either way, as a fruit passes senescence, i.e., the point at which it is at its most ripe, the compounds that give the fruit its colouring are destroyed chemically (broken down). This can happen in a variety of ways. For example, the group of compounds related to vitamin A can be broken down by light4 or by exposure to oxygen in the atmosphere5. Food manufacturers therefore need to do something so that their food may be perceived as attractive-looking. Sadly the normal methods of presentation used in advertising, i.e., putting a picture of a woman with her breasts half-showing on the front, are not quite enough. The solution to this is two-fold. First, they must prevent the degradation processes from happening (preserving, of which more below), and also add something to put the colour back in. It is done with chemical colourings. This immediately makes many people suspicious. They feel cheated or even lied to, almost poisoned. Though of course they have not been lied to really, assuming all the ingredients are listed on the packet. What the manufacturer has done is provide what the customer wants – whether the customer is aware of these preferences and their obedience to them is less clear. Why some customers want bright blue biscuits or green icing is a mystery to some, but when people are hungry, it is amazing what dross will sell. It is possible to unlock this perception of colour versus flavour in a double-layered manner. My demonstration on this when I am lecturing on the chemistry of food is to present four colourless-glass beakers with jelly in them. One jelly is green, one is red, one orange and one blue. I ask the audience which they think is the strawberry jelly. If they have not spent too much time watching QI, they plump for the red one: strawberries are red and thus food containing strawberries is something we also expect to be red. Perfectly sensible. However, we revisit these four jellies when looking at flavouring. 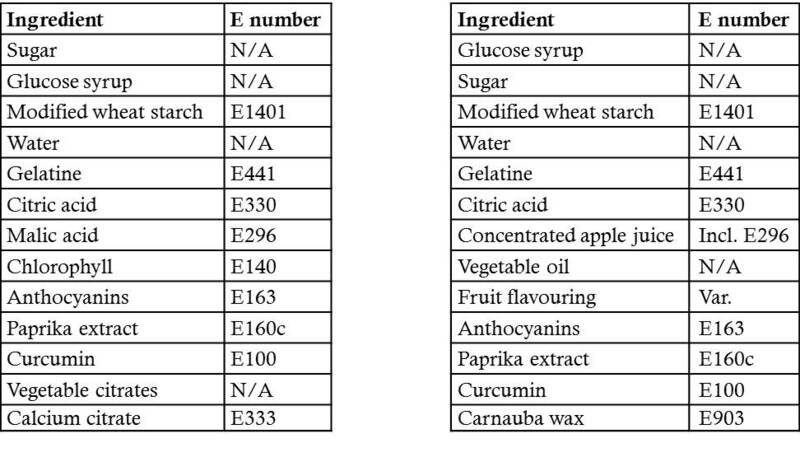 1 ‘Current EU additives and their E numbers’, Food Standards Agency, 2010. 2 ‘Summary of Colour Additives for use in United States Foods, Drugs, Cosmetics and Medical Devices’, United States Food and Drug Administration, 2010. 3 ‘Fact Sheet: E numbers’, Vegetarian Society of the United Kingdom, 2011. 4 L. J. Whited, B. H. Hammond, K. W. Chapman, and K. J. Boor, J. Dairy Sci., 2002, 85, 351. E numbers have been the subject of much controversy. Although the palaver has started to subside, opinion is usually very much weighted towards E numbers being unnatural, unhealthy and artificial (at best). At worst, the media-led belief is that the faintest whiff of an E number will make any small child destructive on the scale of a cross between a hurricane, and a kitchen-seeking missile. Although much of this latter observation has since been attributed to dubious parenting, the grain of truth that started it all is still licensed for food use in the UK and in America. In the late 70s and early 80s it was found that tartrazine (Figure 1) could elevate the symptoms of hyperactivity in children who were already prone to the condition1-5. It has not been found to cause the condition in healthy children, thus separating the effects of such scurrilous indulgences as television, the Internet, and worst of all, pocket money, from the attention deficit condition. The problem for the food industry became that tartrazine and a small handful of others were recorded in the popular press as being both ostensibly bad for human health and representative of E numbers in general. This has led to an apparent disappearance of E numbers from our foods comparable in speed to the ejection of a celebrity magazine from a nunnery. Figure 1–Tartrazine, E102. Chemical structure (left), with a bottle of the compound in concentrated form (right). It should be noted however that the ‘E’ of this name stands for ‘European’ and so although many of these compounds are used elsewhere in the world, in America and in China for example, they are not classified under this system. Wherever you live in the world, at least some of these compounds appear in your food be you fruitarian, fatty or a face in between. However, food manufacturers, those most cunning of foxes, are not that easily put off from using the established tools of their trade. They had a set of ingredients that have been tested in every orifice of every rodent known to man. And probably in man as well, though those tests are not recorded. This set of raw materials for producing food could not be changed drastically if the manufacture of these products was still to be economical. So what they did was simply list the name of the compound instead of its E number. Despite how it may come across, it is legally sound, and despite the media dislike of E numbers that has precipitated their removal by name from lists of ingredients on foods, they are still there; even in ones that are openly touted as natural and healthy. For example, if you compare the lists of ingredients by name with the lists of currently licensed additives in the EU, in many foods the majority of the ingredients will also appear on the list of E numbers or food additives. Two examples are shown in Table 1. Table 1. A tabulated form of the ingredients of two pieces of confectionery available in the UK. Although perfectly safe, the majority of ingredients are E numbers, though none are named as such on the packet. Although it may seem a slight-of-spatula to use the names alone, arguably, an ‘E numbering’ code is not the most explicit way of referring to a compound. No one would expect a consumer to memorise this 1,500-strong list, less still be able to recall it when buying jelly, cheap cider or meals for one in a supermarket. Even with a smartphone to hand, it is hardly accessible. Equally, the names of the compounds are probably as much a mystery to anybody who has not seen more of a laboratory than a nightclub. Also, as we can imagine, referring to E number categorisations is also not in keeping with the idea of ‘natural’ or ‘healthy’ that many food companies wish to promote. Both of these words, ‘natural’ and ‘healthy’, although they sound good in the context of food, are sadly misguided. The most poisonous things on this Earth are from ‘natural’ sources – poisoned ivy, curare (poison-tipped darts), botulism and reality television. Fortunately the last one is not edible. However, ‘healthy’ is more subtly misleading. What is healthy or nutritious for a three-year-old child, a lactating woman, or a man in his 70s is demonstrably different. What we might regard as fine for someone of average weight, might be dangerous for someone who puts Sumo wrestlers to shame. It will also be different if any one of those has a medical condition of certain kinds. For example, some cases of elevated blood pressure have been found to be stabilised or reduced if the patient’s intake of salt is reduced. This is pleasingly irrelevant to anyone not sensitive to such in-take, however it has led to a national panic about anything with salt in it. Sufficient water will allow the body to wash away pretty much anything it does not want, including salt – curare and reality television excepted, however. This washing of the system is a normal occurrence, and is one that allows us to maintain life within our bodies, a situation known as homeostasis. This word just means a consistent set of conditions within the body. This applies to things like body temperature and the concentration of the blood. The upshot of the salty-food thing is, that if you have not been medically advised to cut down your salt intake, you do not need to if you are drinking sufficient water regularly. In fact it is fair to say that your body needs the sodium and chloride ions found in table salt in order to function. Medical conditions that are sensitive to salt intake include high blood pressure (hypertension), and certain kidney and heart problems. 1 D. W. Schab and N. T. Trinh, J. Dev. and Behav. Paed., 2004, 25, 423. 2 B. Bateman, J. O. Warner, E. Hutchinson, T. Dean, P. Rowlandson, C. Gant, J. Grundy, C. Fitzgerald, and J. Stevenson, Archives of Disease in Childhood, 2004, 89, 506. 3 P. A. Eigenmann and C. A. Haenggeli, The Lancet, 2004, 364, 2. 4 B. Weiss, Food and Chemical Toxicology, 1988, 26, 575. 5 F. Levy, S. Dumbrell, G. Hobbes, M. Ryan, N. Wilton, and J. M. Woodhill, Medical Journal of Australia, 1978, 1, 61.